in the luxuriant Louisiana sky. from a shapeless lump of earth. of moss to fall from the trees. she saw before she began to sketch. 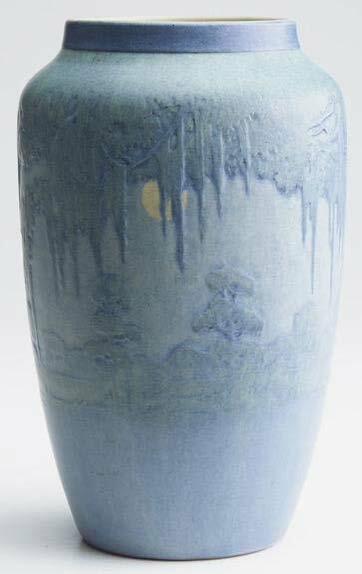 This is an ekphrastic poem inspired by a Newcomb Pottery vase thrown by Joseph Meyer and deeply carved by artist Sadie Irvine with live oak trees and Spanish Moss in front of a full moon. The vase, pictured above, was made in 1919. I love this poem, Roy. It takes me back to the trip Pat and I took to Alabama to visit his friends who lived on Mobile Bay. Everything there was magic. Thanks for your kind words, Diane. Glad the poem invoked good memories for you.